Green was the theme at this year’s PDGA Pro World Championships. From the mountains to the tees, players and spectators were seeing green. World Champions were crowned at Smugglers’ Notch Resort and Disc Golf Center, located in Jeffersonville, Vermont. Smugglers’ Notch is located smack dab in the middle of the Green Mountain range, which is about an hour from the state capitol, Burlington. The Green Mountains stretch from Massachusetts all the way north through Vermont and up to the border of Quebec. 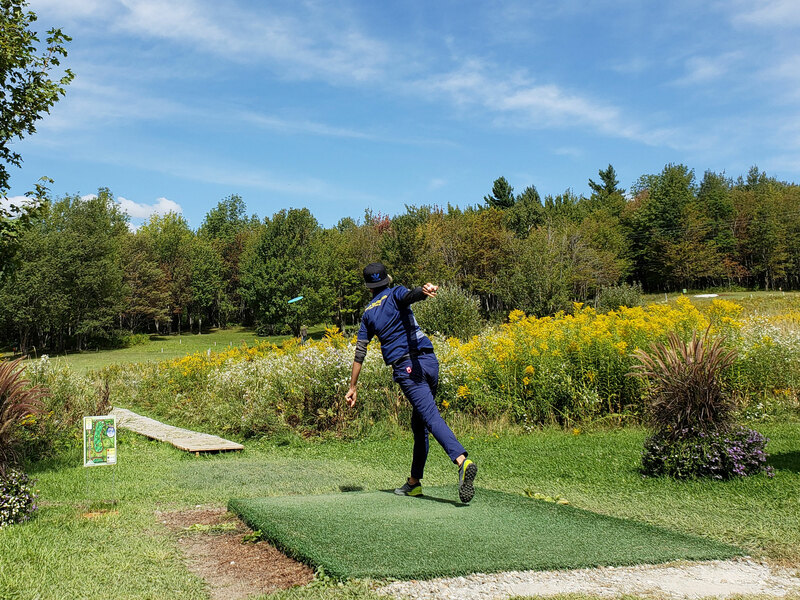 Two beautiful championship caliber courses are found at Smugglers’ Notch Disc Golf Center, along with another 9 holes situated closer to the resort. With a brand new Outdoor Center and Pro Shop on site, it is a true disc golf destination. The two courses used for the 2018 World Championships, Fox Run and Brewster Ridge are quite the opposite of each other. Fox Run is primarily found on mostly open and hilly terrain, while Brewster Ridge is cut throughout the thickly wooded, gently rolling woods of Smugglers’ Notch. Eagle McMahon teeing off at Fox Run hole #1 at the Pro Worlds 2018. While this is the first World Championship played on DiscGolfPark TeePads, this is not the first Major or Elite Series event to utilize the DiscGolfPark TeePad. The Konopiste Open in the Czech Republic earlier this season was played on the Franz Ferdinand DiscGolfPark. Previous majors like the European Open and European Masters have also teed off turf for a long time. More recently, courses and events in the US are going green – Las Vegas Challenge participants were treated to 54 DiscGolfPark TeePads in early 2018. 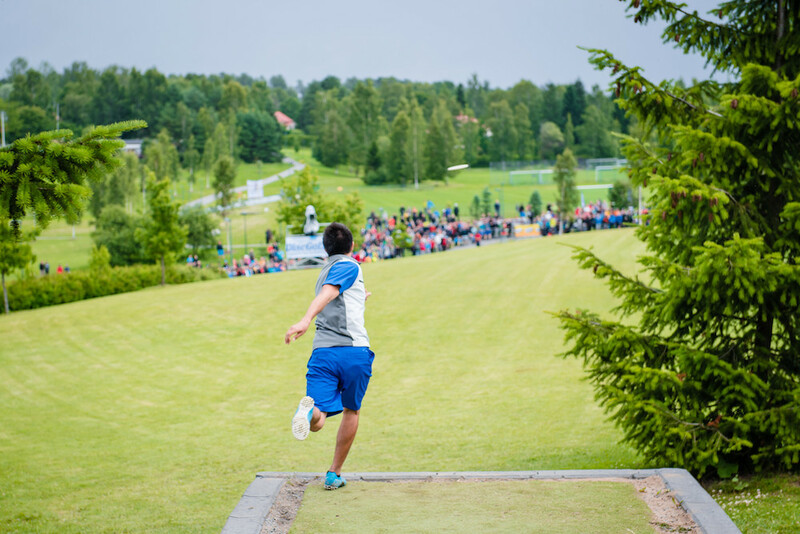 Paul McBeth driving off of the European Open hole #17 TeePad. DiscGolfPark TeePads have been found on Fox Run for the past two seasons. This year, Smuggs’ staff has worked to add turf to the short tees on Fox Run and has also started to implement them throughout Brewster Ridge. The advantages to using turf as a teeing surface are plentiful. They perform well in a wide variety of conditions. Most notably, when you are playing on a wet DiscGolfPark TeePad, you need not worry about slipping. Aesthetically, they help keep these beautiful outdoor spaces like Smuggs’ looking natural. Additionally, playing on a turf surface provides a much lower impact. This means that not only is it easier on your joints and knees, but the life of your shoes is going to be significantly longer. Turf isn’t just for World Championships and other big time events. It is a great option for any type of course. DiscGolfPark offers two different options, dubbed Pro and Am. The Pro TeePad measures out to 12.6 x 7.6, while the Am option is 7.5 x 4.5.